Do you have a sweet tooth and need your sugar fix after lunch? I got you covered! I have some sweetness and chocolate for you. Also, if you are vegetarian, vegan, it’s a keeper. Otherwise, it’s a keeper anyway! I know, I rock. I’m talking tartlets tasting like heaven and not staying on your hips! 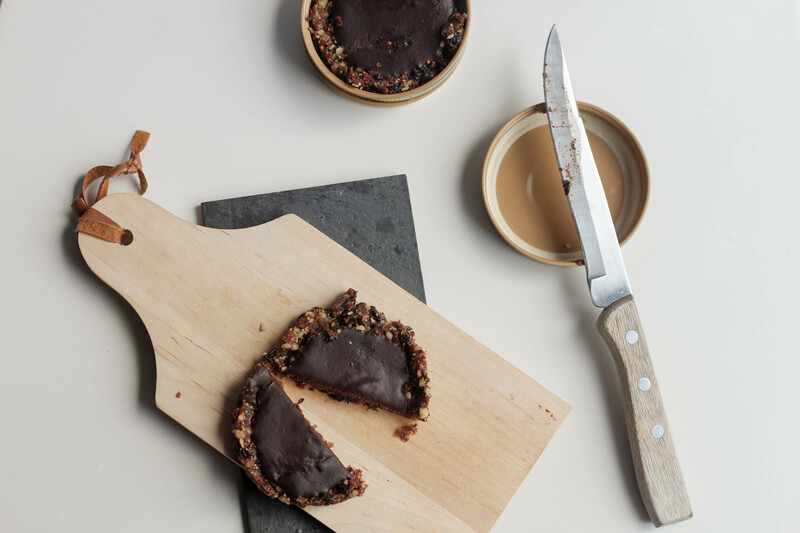 In fact, this tartlets will satisfy your craving and not give you bad conscience. Come on, admit it, don’t you feel bad after eating a bad chocolate bar just because? You can tell me, it’s me! Because, I do. After lunch, I generally look for that little something sweet that will mark the end of the meal. A nice expresso don’t always work, sometimes it calls for nice piece of chocolate to go with it. Since we only live once and I own my curves, I indulge! 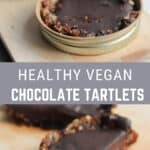 However, I will try to make smart choices and Ta-da, now you have my healthy vegan chocolate tartlets. I used the lids of my mason jars as mold and it makes the perfect size for a treat! I got this idea from Dessert for 2, Christina is always so creative. There is no sugar added and yet it is sweet. The figs and raisins are doing all the job. 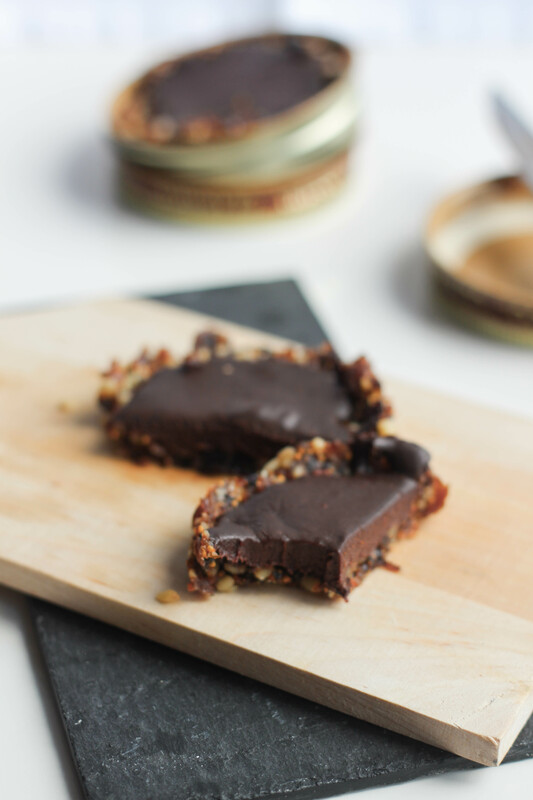 The combination of the nutty taste of the walnut and the chocolate will make ask for more! Now, there is a mashed banana in the chocolate. I love it! You can taste a little hint of its flavor. I got guinea pigs that did the test tasting of the tartlets and one of them would have rather not feel the banana taste. So if you want when you melt the chocolate, instead of the banana, you can pour a dollop of milk to help it melt (2 or 3 tablespoons, not more) but then it’s not vegan anymore. But it’s an alternative. Don’t trow out to the garbage this ugly-looking banana! Make me some tartelettes and a nice smoothie to go with it. Why not? Bonus: Kids liked it too! - In a food processor, put the figs, walnuts and raisins and pulse until there are no walnut chunks anymore and all the ingredients are starting to stick together. - Prepare your lids, place some aluminium foil at the bottom, to prevent from sticking. - Spread the ingredients previously mixed in the lids, pressing with your fingers to make your 'crust' evenly spread. - Place in the oven and bake for 7 min. - In the meantime, mash the banana. To avoid in lump, put it through a small strainer. - In a pan, melt the chocolate with your banana puree. - Once your lids are out of the oven, pour your melted preparation in the mini tartelettes until filled. - Allow to cool down and place in the fridge for 2 hours. 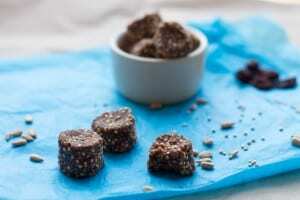 Keep refrigerated in a air-tight container up to a week. These look incredible! I love the mason jar lid idea – mini springform pans! Love this! 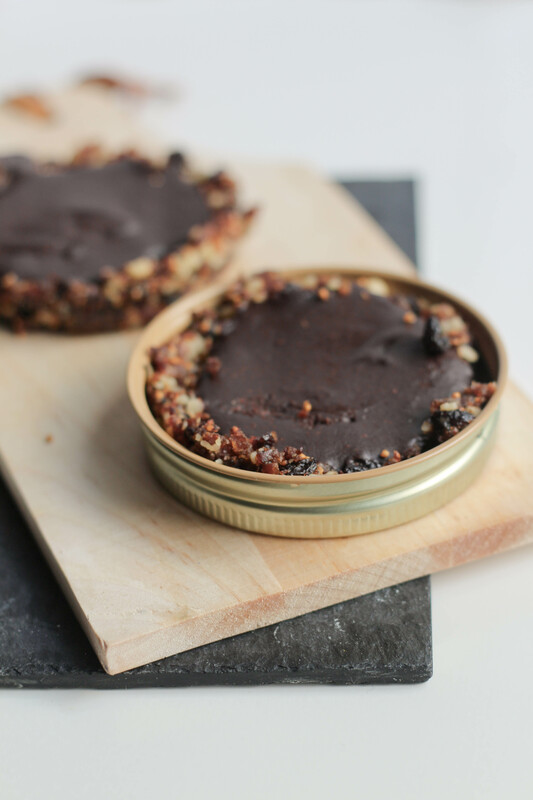 Clever using the mason jar lids and such a healthy dessert or snack. Thanks for sharing. I saw the mason jar lids on Dessert for Two blog and I loved the idea!